Our Organic Cotton T-Shirt Tote is great for general purpose shopping and as a companion to our heavy duty Deluxe Grocery Bags. It's 15 in. tall x 15 in. wide x 4 in. deep size is a little larger than plastic grocery bag, not too big and not too small. Extra wide double layered fabric handles provide strength and comfort when carrying heavy loads. Long lasting, heavy-duty construction will allow you to save paper and plastic bags for many years. Like a super strong plastic checkout bag with a little more room. 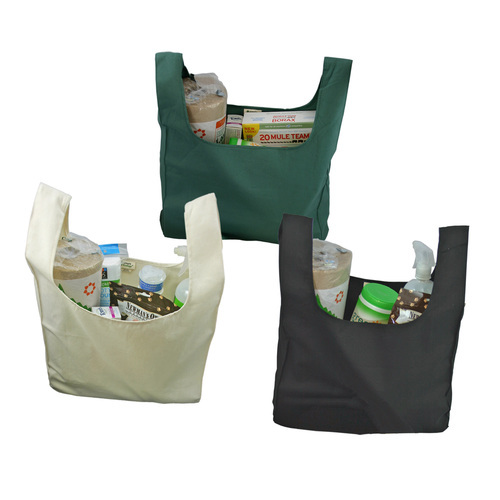 2 inch extra-wide handles are double layered for comfortable carrying and strength and make carrying multiple bags easy. The perfect bag for trips to the mall, market, convenience store and drugstore and great for bulkier items. The bag is lightweight and will fold into a 5 in. x 5 in. square that easily fits into your purse, briefcase or glove box. Made in India of lightweight yet sturdy 7 oz. organic cotton canvas, certified according to Global Organic Textile Standards (GOTS) for ecology & social responsibility. Since they're made of organic cotton they bring additional benefits to the environment and our health by avoiding the highly toxic pesticides, fertilizers and processing chemicals used in regular cotton crops. Beware of cheap synthetic fabric bags. 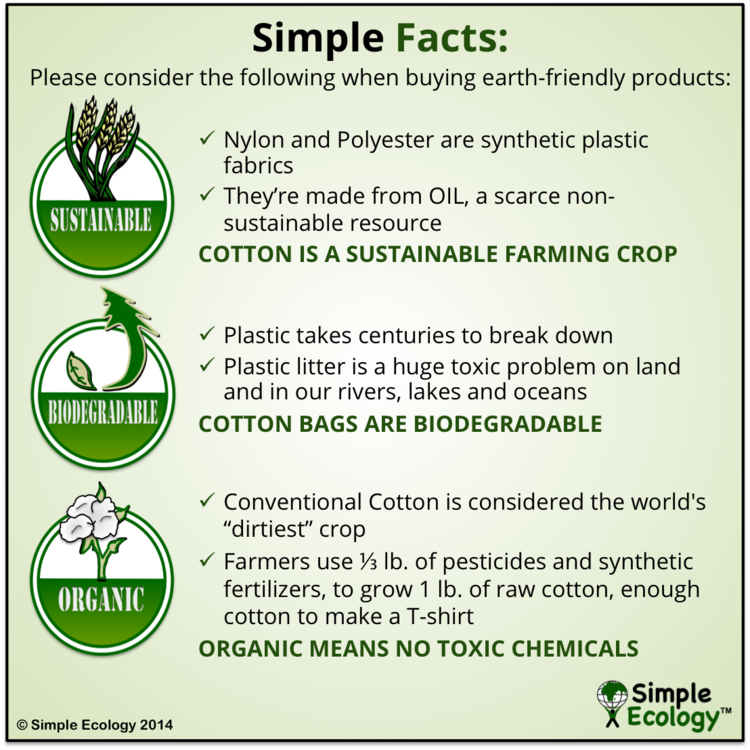 Cotton bags are natural, sustainable and biodegradable. Polyester and Nylon are made from oil, NOT natural, NOT sustainable and NOT biodegradable. T-Shirt Totes are made of canvas and will last for many years. They are easy to care for by washing them in COLD water and flat or line drying. Color bags are prewashed during the dyeing process so the fabric is slightly softer and shrinkage is minimal. NATURAL BAGS are unprocessed canvas so after the first few washes Natural bags may appear excessively wrinkled and shrunken, depending on your water hardness and laundry detergent. DON'T BE ALARMED. You can stretch them back out and reduce the wrinkles by pulling on the fabric and smoothing the the wrinkles on a flat surface when the bag is wet. After stretching and smoothing, fold it flat and air dry. The Natural bags permanent shrinkage will be 5-10%. BOTTOM SUPPORT: A rigid bottom support will help keep bottles and heavy items in place and allow the bag to stand much easier in your car or on the counter. To make one, cut a piece of heavy cardboard to the size of the bottom (approximately 12 inches by 4 inches) and place it into the bag at the bottom. It also helps keep the bottom clean; when it gets worn and dirty, recycle it and replace it with a new one.